Unionville Blake Charlton loses the handle on a first quarter fumble against Garnet Valley, Friday night. CONCORD — To say Unionville had a tough time with Garnet Valley, in both schools’ high school football season opener, would be a bit of an understatement. The highly anticipated match up of the defending 5A District One champs — the Indians – and the 6A District One runner up — the Jaguars — was pretty much one-sided start to finish, with Garnet’s run game and stifling defense leading to a 42-3 rout. Pretty much from the start, the Indians (0-1) couldn’t find a way to stop Jags’ running back Colin Robinson, who rushed for three scores and 116 yards on the ground. It didn’t help that the new look Indians’ offense couldn’t sustain on offense and had to battle turnovers. 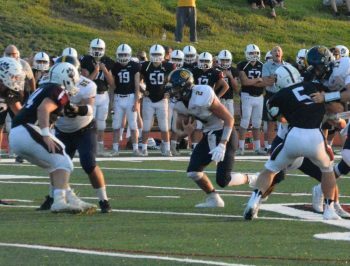 The Jags (1-0), meanwhile, used their option offense perfectly, wearing down Unionville. Unionville’s Nick Schnaars looks for running room against Garnet Valley. A combination of factors made it impossible for the Indians to fight their back back into the game. As bad as the scoreboard looked, Clark expressed some optimism that — especially on defense — it was a matter of small issues, rather than major breakdowns. The Indians’ lone score came on Dominic Braithwaite’s second quarter field goal. Garnet took the opening kickoff after the Indians’ deferred and promptly marched down the field, scoring on Robinson’s 4-yard run. 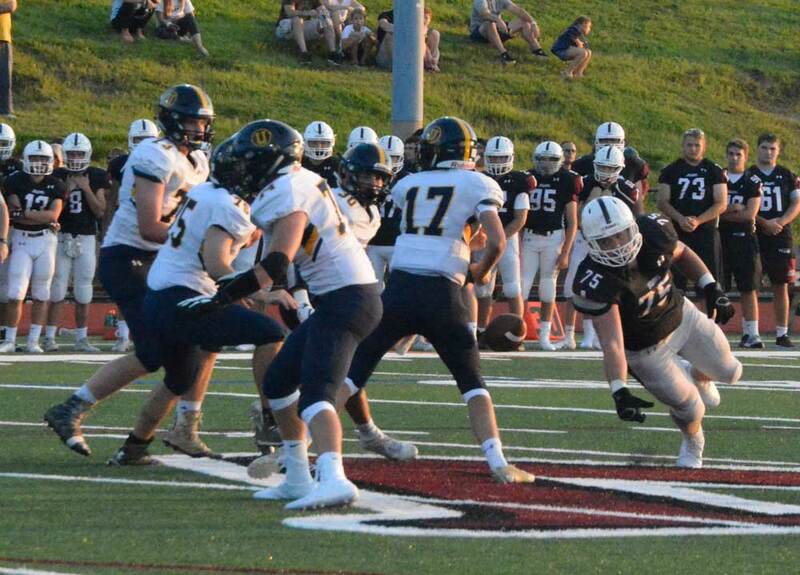 After Unionville saw a drive stall with fumble by junior QB Blake Charlton, Garnet marched right down the field — often finding running room up the middle — with Rory Glackin scoring a 12-yard run to make it 14-0 in the second quarter. After Braithwaite’s field goal — a 22-yarder — the Jags again marched down the field, with Robinson scoring from six yards out to make it 21-3 at the half. Unfortunately for Unionville, the second half turned out to be more of the same. An opening drive showed promise, but was snuffed out by a fumble by Nick Schnaars. Worse — after gouging the Indians on the ground, Garnet QB Cole Palis then went to the air hitting Adam Oldrati with a 47-yard pass that set up another Robinson rushing score. That made it 28-3 — and Indians were no closer to figuring it out. The Jags added two more scores in the final quarter — the second when both teams began to blend in younger players. While it looks like Garnet has barely lost a beat — despite losing a number of key players to graduation — Unionville finds itself needing to find answers, and quickly. With a tough Academy Park looming Friday for the home opener – AP beat always tough Pennsbury 28-21 Friday night — Clark said his team is going to need to get to work to play the kind of football more typical of his 14 years at the helm. In other key matchups around Chester County Friday night, Great Valley held off Phoenixville, 28-15. Avon Grove defeated Kennett, 21-7; West Chester Henderson was overwhelmed by Oxford, 30-7; Downingtown East pounded Plymouth Whitemarsh, 41-7; Downingtown West fought of Perkiomen Valley, 44-33; West Chester East defeated Council Rock North, 27-14; and Bishop Shanahan defeated Benjamin Franklin, 28-12.